Keep your horse pain-free and performing his best! Introducing 27 simple body checkups you can do on your horse--Where Does My Horse Hurt? is a do-it-yourself method for determining when and where your horse hurts. With this easy-to-follow book, conveniently spiral-bound so you can lay it open on your tack trunk and follow the instructions as you work on your horse, you will: - Become familiar with your horse's normal range of movement so you can prevent minor issues from becoming major. - Stay in tune with areas of temporary or chronic discomfort so you can offer relief as needed. - Solve "mystery" or "phantom" lamenesses that come and go seemingly without reason. - Save thousands of dollars by avoiding expensive diagnostics that rarely get you answers. - Learn how to discuss potential problem areas with farriers, veterinarians, and bodyworkers. - Keep your horse actively and happily "in work" for more months of the year, and more years of his life. 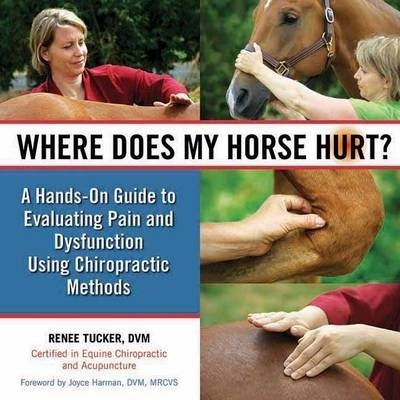 "This remarkable book, written by a veterinarian who is certified in equine chiropractic and acupuncture, offers a wealth of information for systematically assessing a horse's condition and deciding whom to call when things go wrong." --Mary Daniels, "Dressage Today"
Renee Tucker, DVM, is a veterinarian specializing in equine acupuncture and chiropractic work. She lives in Redding, California.